Letter E-Eyesight Humor- Helping Hookers Get Home Safe. There is nothing funny about people who have and struggle with serious eye deficiencies; be it anything from blindness to glaucoma. However, it would seem that many of us who have begun to age (slightly), have to find some humor in the natural aging process. It starts when you seem to go to the Eye Doctor as frequently as the Dentist, or Family doctor. As noted before, you arrive 10 minutes early, have to wait at least 20 minutes and are then insulted, as they give you long forms to fill out that you’re sure nobody will read or take seriously. I know this because on my last visit, under the comments/concerns section, I wrote that I would like the “Superman/X-Ray Vision Upgrade..” Nothing, Nadda………Not even a smile, or an exasperated sign. I won’t lie; I am suspect of people with no sense of humor! 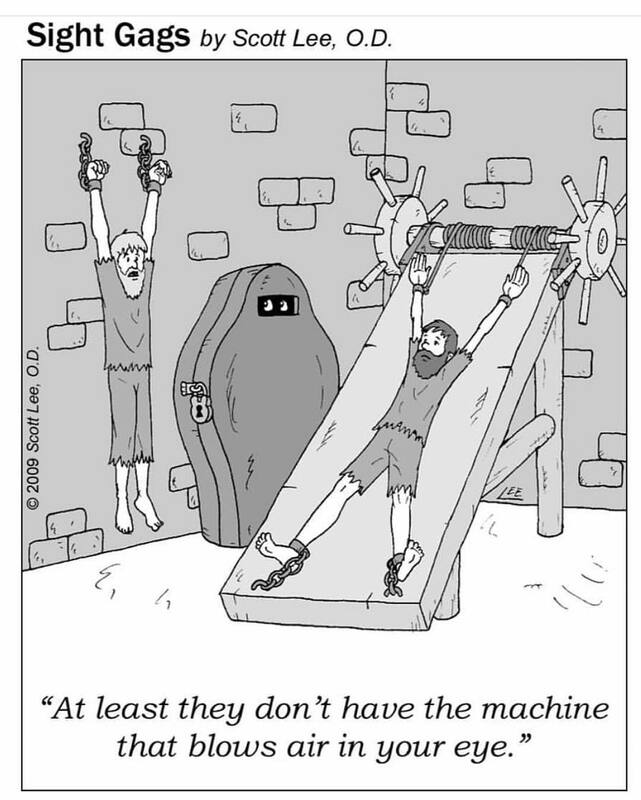 Then there is the machine that blows air into your eye………the comic above should cover that subject, and it is a very funny comic indeed. Out of nowhere, you join “The Club.” You heard rumors…..hushed whispers from the older “kids;” maybe even an overheard embarrassed confession at the “confidential booth” at the local pharmacy. You never thought it could happen to you, but suddenly, there you are; walking around the room/floor/house looking for your eyeglasses….that’s right; admit it……they’re on top of your head! Oh, the shame! A few weeks ago, I was driving home from work. I had been working a lot of hours and was quite exhausted. There is one very dangerous section of the highway that joins multiple traffic patterns. Flows entering……exiting………crazy drivers……..righthand turns from the left-hand lane…etc. Above the lanes is an electronic message board from the Dept. Of Transportation. They usually broadcast safety messages. Great spot huh? Anyway, as I bobbed-and weaved, I read the message quickly and moved on. 3 Exits latter, the content of the sign hit me; “Help Hookers Get Home Safe!” What the hell? Did I read that correctly? Maybe it really posted that, or maybe “someone” may have hacked the DOT and were wreaking havoc as we speak. I know, not plausible; but for a brief moment I considered exiting the highway, and making my way all the way backward 10 miles to retrace my trip so I could enter the highway merge again to re-read the sign. Ah NO…….not at 4:30 PM. It may have been the one time I was looking for the next day’s afternoon commute. SPOLIERS!!!!!! That’s not exactly what the sign said. “Oh, really Zulu?”Not a news flash!” You got me; The sign actually said “Help Workers Get Home Safe. Technically Hookers might be workers……but let’s leave that “one” alone for the moment. Also, this was no Freudian derivative. I guess I’ll have to write it up to distracted driving, poor eyesight, science, and being tired. Some of you may have seen this, but I will leave it for those who have not; it’s actually very cool (NO…the spelling mistakes are not the usual ZD45 Blog!!!!!!). Hi Den, I got an account so I can follow you! That’s funny! I’m always reading signs and even typed words wrong. Most times it makes no sense, but I get a laugh out of it. Not being able to see very well…ugh…I have glaucoma and now they say I have cataracts, too. Most blog posts I read, I have to use the zoom to get the letters large enough to read. Those signs are really dangerous. I notice traffic slows down before them and then resumes to normal speeds after them. That cannot be a good thing. Cheers and happy first week. Enjoy your day off tomorrow!